When a WAF policy is attached to a virtual service, specific WAF logs are generated. To view the log files, navigate to Applications > Virtual Services. Click on the virtual service mapped to the WAF policy, and navigate to Logs. 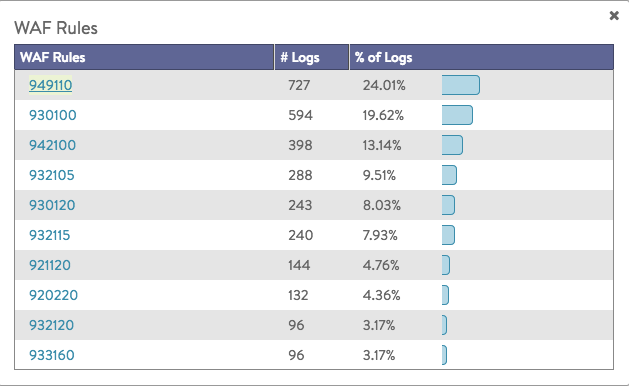 The logs can be filtered to view specific WAF entries. Type WAF on the search bar to populate the available options. These filters can be used for WAF Log Analytics as well. Timestamp: Time of capturing the log. WAF: Result of WAF evaluation. For more details, refer to the WAF Status section. Client IP: IP address of the client. URI: URL of the evaluated traffic. Length: Size of the response body. Duration/Timeline: Duration of the traffic. REJECTED: Policy is in enforcement mode and the request was rejected. FLAGGED: Policy is in detection only mode and the request was logged, but not rejected. PASSED: Request passed the WAF policy without any match. - : Not applicable. The request was not evaluated by WAF. Clicking on the + sign at the end of each log entry will expand the panel to provide more details. Significance: Indicates WAF policy match. Note: This is the first indicator of a matched WAF policy and does not indicate if the request was rejected or not. WAF response time: Displays the execution time for all four WAF evaluation phases. Add Exceptions: Under the WAF Hits section, click on + Add Exceptions, to create an exception for a false-positive remediation. Exceptions can be created either at a group or a rule level. The exceptions created will be activated immediately. Navigate to Applications > Virtual Services. Click on the virtual service mapped to the WAF policy, navigate to Logs, and click on the right side panel to access Log Analytics. Each section provides an insight into the currently filtered traffic. Analytics can be generated based on the time frame chosen, such as Displaying Past Week, Displaying Past 6 Hours, etc. 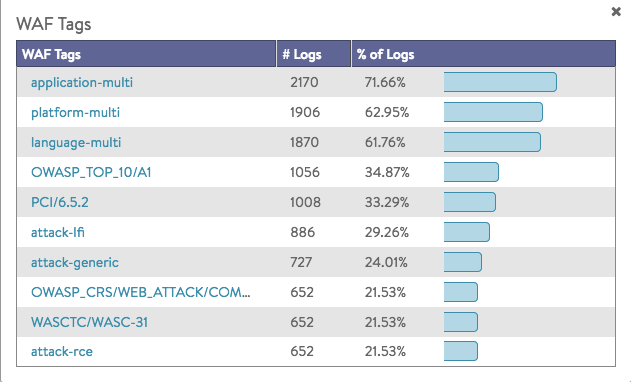 The new WAF log analytics items can now be used in conjunction with the already existent analytics. The following screenshot shows a sample of logs displayed on choosing FLAGGED WAF status filter along with CRS_949_Anomaly_Evaluations rule group under WAF Groups in the Analytics tab. 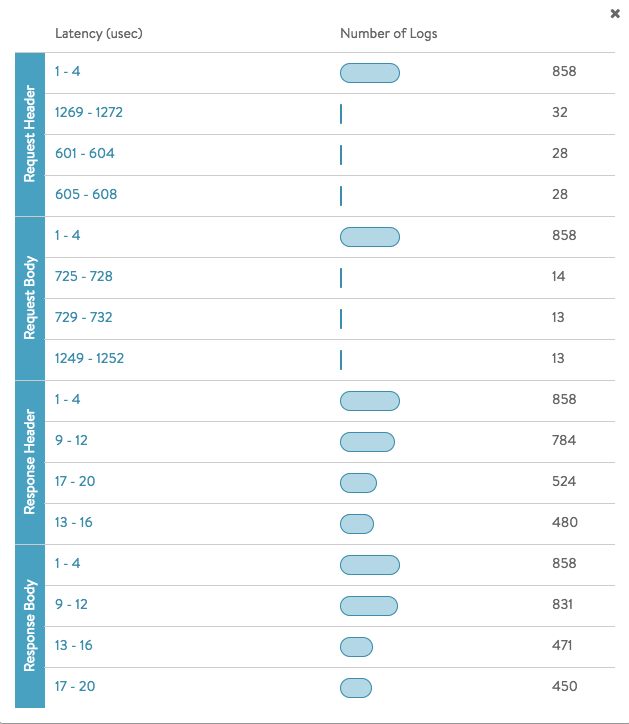 Overview of the tags that were hit during the selected time frame. Overview of the rules that were hit during the selected time frame. Overview of the groups that were hit during the selected time frame. Groups can be expanded to show the distribution by rule. Summary of the latency in microsecond for the log entries in a given time frame. To view WAF related metrics, navigate to Applications > Virtual Services. Click on the virtual service mapped to the WAF policy, and navigate to WAF. The chart in this tab displays WAF rule hits against the chosen time frame. This helps analyze denied requests and their corresponding trigger. All elements in each field are displayed with the corresponding hit count. On discovering a false positive, any rule or group can be disabled, by using the toggle button. You can click on any element in each field to create a specific filter. Then, the field Popular Combinations displays the known combinations and their hit counts related to the chosen filter. The filter can be reset by clicking on Reset filters. On choosing a specific filter under Client IP, Path, and Match Element, you can add an exception for the selected combination. Click on Preview Exception to view the exception on the right-side pane. To add this exception, click on the Add Exceptions icon. The policy will be updated immediately. Note: For previewing and creating exceptions, ensure that the required rule is selected as a part of the filter. For instance, clicking on ARGS:ip under Match Element, provides a preview exception option as shown below. You could choose multiple field elements to create a more specific exception entry. On choosing a specific filter, you could preview logs for that combination by clicking on the Preview Logs icon. In the example below, the grayed out elements in the screenshot represent the filter elements chosen. On clicking Preview logs, a log table as shown below will be displayed.